I am in no way a 'hater' or disrespecting any of these ladies or any other celebrity. i have been obsessing for years of the beauty of stars and felt very bad for myself and maybe a little self-conscious about what i looked liked. then i found that some celebrities ALSO need a little help (or alot) to look the way they do. I admit a couple of these ladies are freaks of nature for being so damn beautiful without makeup but as you can see most of them dont. hope you like my list of these celebrities WITHOUT MAKEUP! 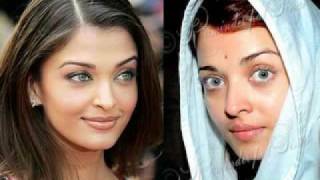 why Aishwary Rai paints herself white? self loath?